Birds have many more vertebrae in the neck than humans, ranging from about 14 or 15 and up to a maximum of 25 in the swan. Humans have 7. 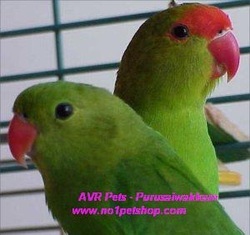 In the parakeet, there are said to be 11. In all birds, they are much more mobile than in mammals, which is why most birds can turn their heads 180 degrees. The neck is one of the strongest parts of its body, so the suggestion that "it broke its neck" by flying into a window, or if it is found dead, is usually incorrect. Because of the mobility of the neck, a limp (dead) bird often appears to have a broken neck, but this is almost never the case. Unlike the type of jaw found in mammals, in birds, BOTH the upper and lower jaw are moveable. Feather movement is brought about by feather muscles, which attach to the walls of the follicles. These muscles allow a bird to fluff up the feathers when chilled or sick, and allow a bird to ruffle the feathers, realigning them when necessary. No bird has more than 4 toes. Rheas, cassowaries and emus (large, flightless birds) have 3 toes, as do woodpeckers. Only one species, the ostrich, has two toes. Flight is a highly energetic form of exercise. A budgerigar flying at sea level uses 1 ½-3 times as much oxygen as a mammal of similar size running. During flight, the bird increases its oxygen consumption by about 13 times over the resting metabolic rate. To facilitate flight, most bones of birds are hollow. Swallows migrating between Europe and Africa must fly for about 50 hours over the Sahara without resting. The American Golden Plover flies over 2000 miles non-stop between Alaska and Hawaii. The Arctic Tern migrates from pole to pole, the round trip totaling some 20,000 miles. Swifts can fly at up to 60-90 miles per hour. Penguins can swim underwater at about 20 mph. Ostriches can run up to 50 mph. The migrating Bar-headed goose rises from near sea level to traverse Himalayan peaks that are over 9000 meters high, which in human energetic terms is equated to riding a bicycle over the summit of Mount Everest. Aircraft have reported collisions with birds at absolutely astounding altitudes. A vulture was reportedly struck at over 11,000 meters. Birds truly have a unique and remarkable respiratory system and an adaptable cardiovascular system, giving birds an energetic superiority over mammals. An unacclimatized man is in a state of incipient hypoxic collapse after 10 minutes at 6100 meters, but an ordinary house sparrow can fly and even gain altitude at that height (as proven in a hypobaric chamber). The skeleton of the hand has undergone considerable simplification and adaptation for flight to create the end of the wing. In most birds, there are only three digits (fingers) present. To prevent flight, pinioning is performed by cutting off the manus (hand) at the wrist (carpal) joint. Birds do see in color. Birds can see into the near-ultraviolet wavelengths of light. In primates, the lens of the eye acts as a yellow filter, which cuts off wavelengths of light below 400 nm, and therefore renders ultraviolet radiation invisible. The cornea and lens of diurnal (up during the day) birds are optically clear and appear to transmit wavelengths down to about 350 nm, thus rendering near ultraviolet radiation visible and absorbing only those ultraviolet wavelengths which are not physiologically destructive. Owls can fly between obstacles and can hunt successfully in what appears as pitch darkness to humans. Deep diving species of birds can close the external ear canal completely to prevent water from entering. The temporal resolution of the avian ear is about 10 times faster than that of the human ear. Thus, the song of the Chaffinch would have to be slowed down 10 times before the human ear could resolve all of the details which are learned by the Chaffinch chick.